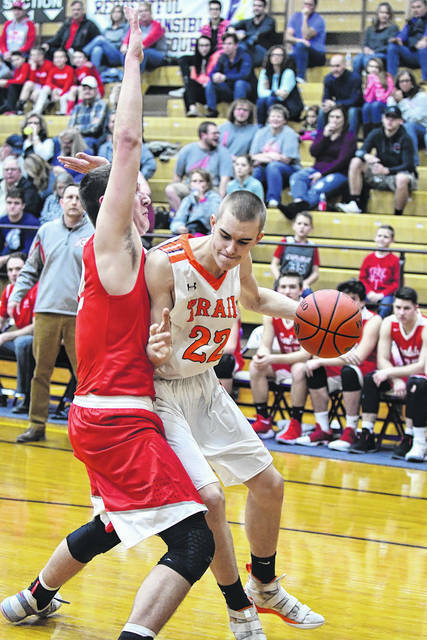 National Trail’s Dalton Mason is fouled going for a layup during the second half of the Blazers sectional tournament game on Saturday, Feb. 24. 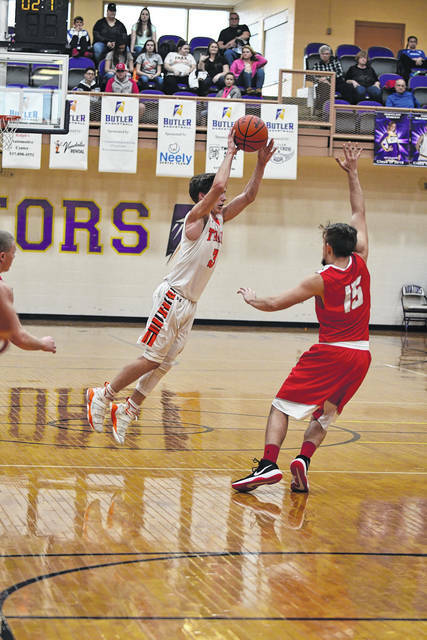 Mason, along with Cameron Harrison and Zach Woodall each scored 15 points in the Blazers 58-46 win over Carlisle. 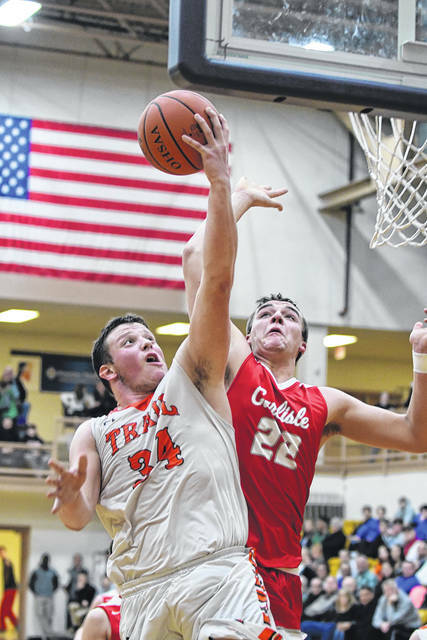 VANDALIA — National Trail held Carlisle scoreless for the first seven minutes of the second half en route to a 58-46 win in the first round of the Vandalia Division III boys’ sectional basketball tournament on Saturday, Feb. 24, at Vandalia-Butler High School. The Blazers used an 11-0 run to begin the third quarter to turn a 26-23 halftime deficit into their second tournament win in as many years. “We thought going in it was going to be two fairly even teams and it was going to be a battle. It was. The defense we played coming out to start the second half gave us a chance to grab that lead and play with the lead instead of playing from behind,” Trail coach Mike Harrison said. Trail led 15-13 after the first quarter. In the first half, Trail was 9-of-27 from field. “The first half I thought we were getting good shots. We just weren’t hitting. We were missing some shots we usually make. 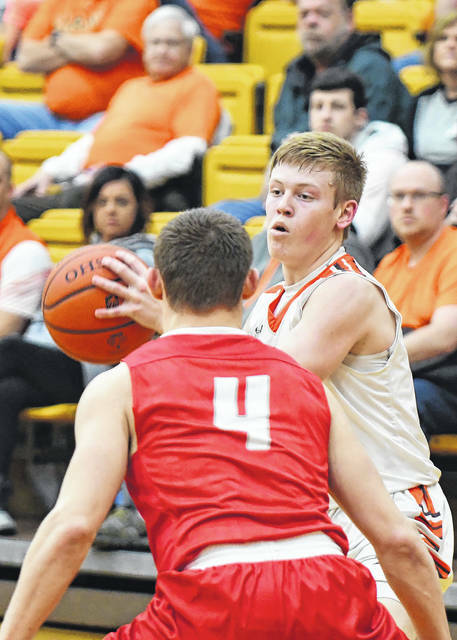 I thought if we kept running our stuff, kept being disciplined on the offensive end that we would eventually start knocking some of those shots down,” Harrison said. Freshman Cameron Harrison kept the Blazers in the game in the first half, scoring 13 of his 15 points. In the second half, senior Dalton Mason and sophomore Zach Woodall did a bulk of the scoring. Mason scored 11 of his 15 in the second half, including eight in the third quarter. 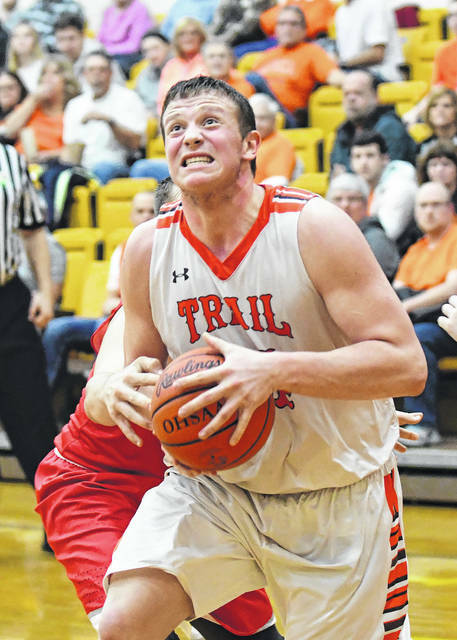 Woodall tallied 12 in the second half, including 10 in the final quarter. Senior Travis Hunt finished with seven and junior Adam Eyler added six, all in the fourth quarter. 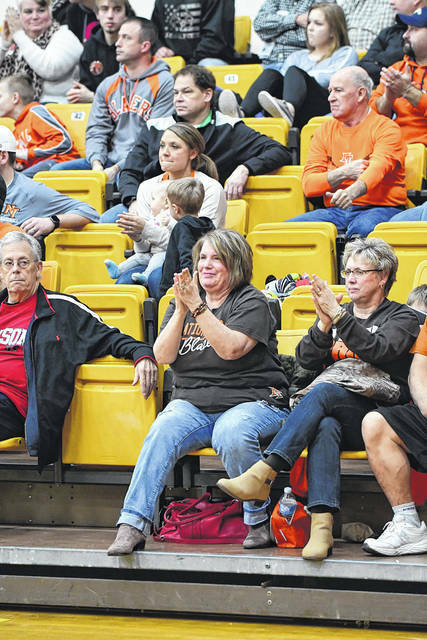 The Blazers led 38-30 after three quarters, after outscoring the Indians 15-4 in the quarter. 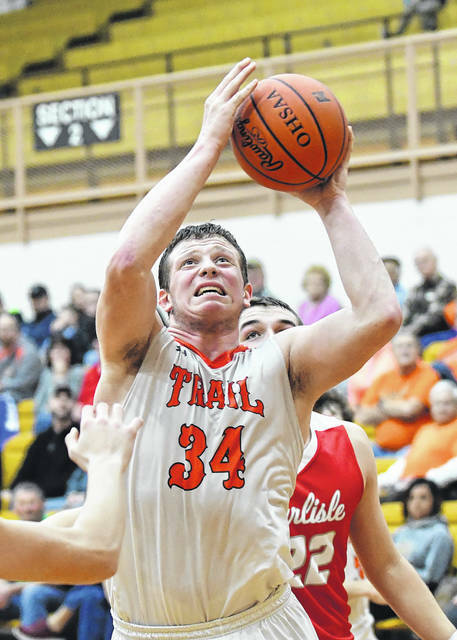 Trail finished the game shooting 21-of-47, while the Indians were 19-of-50. 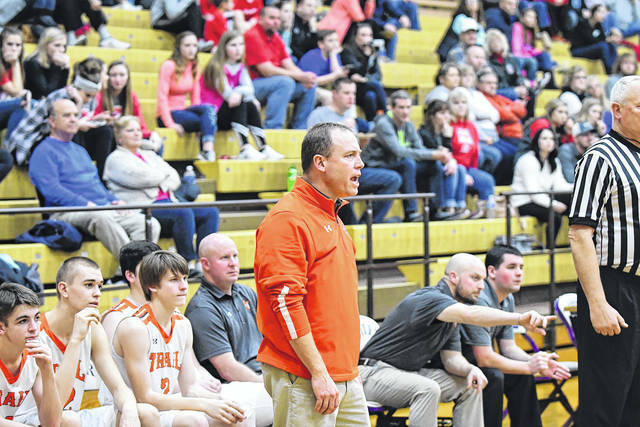 Trail (15-8) is scheduled to play Brookville on Wednesday, Feb. 28 at 6 p.m. at Vandalia-Butler High School. 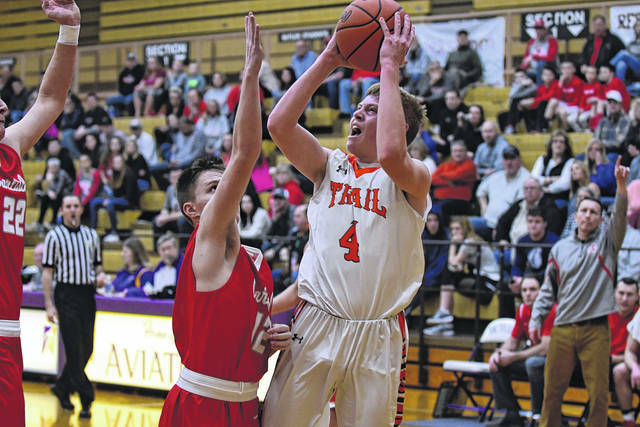 The two teams met two weeks ago with the Blazers coming out on top, 64-60.
https://www.registerherald.com/wp-content/uploads/sites/41/2018/02/web1_ntbbk1.jpgNational Trail’s Dalton Mason is fouled going for a layup during the second half of the Blazers sectional tournament game on Saturday, Feb. 24. Mason, along with Cameron Harrison and Zach Woodall each scored 15 points in the Blazers 58-46 win over Carlisle.